I've always had a soft spot for horses. 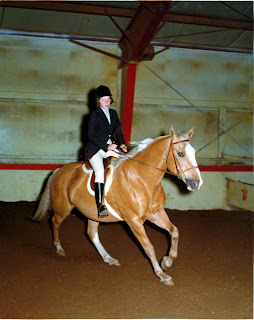 We kept horses when I was growing up, and I rode for many years with the Jefferson County based Westernaires. Like many young girls, I eventually outgrew my obsession, but I have fond memories of my involvement with horses in my teen years. So when the Bureau of Land Management decided to euthanize a herd of 2,000 mustangs and burros because no one was available to adopt them, it was somewhat upsetting. The BLM didn't want to euthanize the animals, but simply doesn't have the budget to maintain them. Enter Madeleine Pickens, wife of energy kazillionaire T. Boone Pickens. Bless their hearts, she and Mr. Pickens volunteered to adopt not only the entire heard of mustangs and burros who were slated for euthanasia, but also a herd of 30,000 currently in federal holding pens. They're working out the details now in terms of finding land for the horses and burros. Thanks, Mr. and Mrs. Pickens. Lance, I graduated at the 1984 Stock Show. So did you know Beth Weber or Barb Weber? They would have been involved around the same time as you. The names don't ring a bell (Mad Cow). I was in Red Team for the last 4.5 years I was in Westernaires, so unless your sister and mom were involved in the Varsity team or the specialties I was involved in (Liberty, Bullwhips, Trick Roping, Crimson Ranger training) it's unlikely I would know them. Was your sister ahead or behind me? God, he was beautiful, wasn't he?